Bert Johnson Lost Weekend owner Christy Colcord and Steve Stevenson, owner of 1-2-3-4 Go! Records. 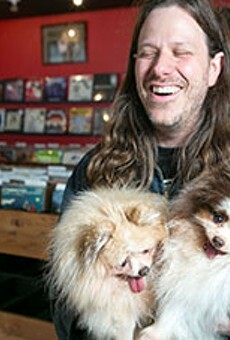 Some of the most popular items at Lost Weekend Video — an eighteen-year-old video rental store and Valencia Street fixture — are the "cinemetal" T-shirts. They feature the names of art-house directors fashioned into the logos of metal bands. It's a simple yet clever convergence of two artistic niches that would make any subculture aficionado smirk. In a similar convergence, on April 1, Oakland's 1-2-3-4 Go! 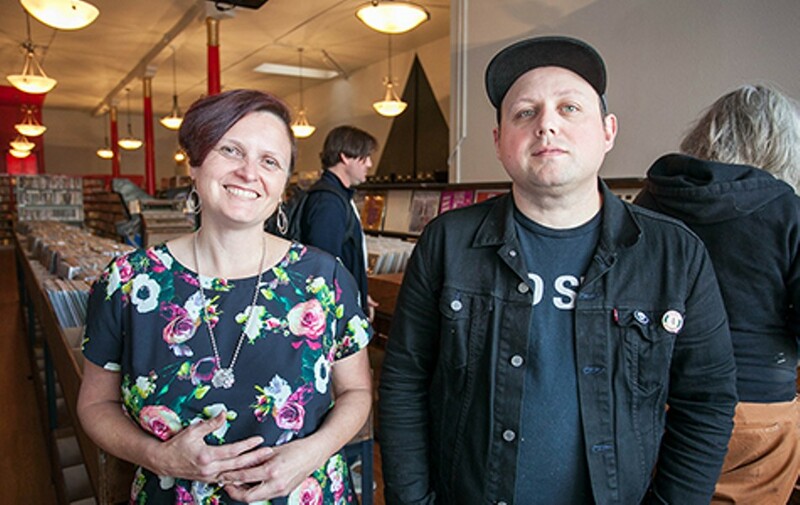 Records expanded into half of Lost Weekend's space — in hopes of eliciting that same smirk. The idea is that by selling records and cassettes alongside Lost Weekend's rentable DVDs and VHS tapes, 1-2-3-4 Go! can help keep the video store's lights on. The question is, can the niche popularity of music's anachronistic formats compensate for the decreasing popularity of film's? Veterans of the Mission district will tell you that they love Lost Weekend Video, but according to co-owner Christy Colcord, a relative few regularly rent movies. That reality can be credited to myriad technological shifts that have rendered video stores seemingly unnecessary — most prominently, the rise of online streaming. Meanwhile, rent in the city continues to rise precipitously. By the end of 2014, it became too difficult for the store to exist on its own. On the other side of the bridge, business has been good for 1-2-3-4 Go! So, when Lost Weekend posted a Facebook status that it would shutter unless it found a co-tenant, 1-2-3-4 Go! owner Steve Stevenson smelled opportunity. Partly, people are drawn to record stores for the experience of flipping through bins and chatting with the clerks about mutual interests. Lost Weekend devotees love it for that same reason, but video stores aren't recognized as hubs for film culture in the same way that record stores are for music. Vinyl, perhaps due to its greater vintage appeal, has cultural cachet that DVD and VHS don't. (Certain genres have cult appeal on VHS, especially horror, but it doesn't parallel vinyl.) The novelty of owning vinyl records propels people to buy them — not the necessity. Colcord hopes that, by association, people will recognize the novelty of physical movie formats as well, and the necessity of a place for cinephiles to geek out together. The irony is that people don't actually need record stores as much as they need video stores, in terms of access to content. "You could probably technically order everything I have in my store online on some website somewhere, or you could definitely get most of it illegally or legally without leaving your room," said Stevenson in an interview. The Lost Weekend collection, on the other hand, consists of more than 27,000 titles — thousands of which can't be found anywhere online or in the handful of other video stores that still exist in San Francisco and Oakland. The store's basement is lined with VHS films that never even made it to DVD. It's more than a store — it's an archive. "I don't think people realize what they [would be] losing," said Colcord. "Not that Lost Weekend is this shining star, but just in terms of access, I don't think they realize the magnitude of what they're losing." Lost Weekend owners are ready to do whatever it takes to keep their collection accessible. Aside from the 1-2-3-4 Go! 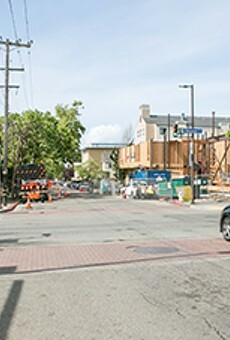 collaboration, they will also soon be opening a video store, bar, and comedy club in Uptown Oakland, that they hope will help underwrite rent in San Francisco. Lost Weekend currently hosts popular comedy shows in its "Cinecave" downstairs. But, they need a bigger space if they want to make enough to sustain the store. "Ironically," Colcord said, "growth is going to be the only thing that can save us." Meanwhile, Stevenson has been tending to his half of the counter in San Francisco, and he said that business has been better than expected. 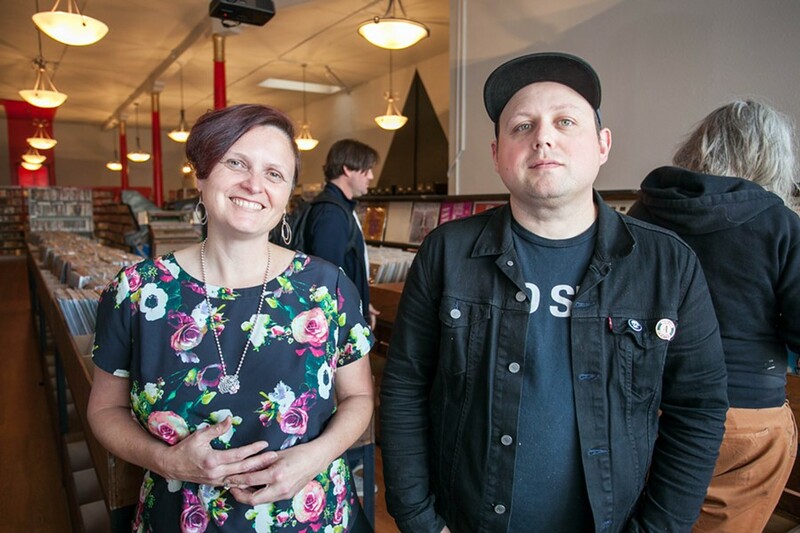 A large crowd showed up for the soft opening on April 1, and he's expecting an even larger turnout for the grand opening on Record Store Day (April 18). The store will open at 8 a.m., and the Voodoo Van food truck will be outside all day to keep the crowd satiated. In an ideal world, all those record buyers would also open accounts to rent videos, and Lost Weekend would hang on until DVDs make the same kind of comeback that vinyl has. But even Colcord is skeptical of that ever happening, because people don't have the same connection to the materiality of film formats as they do to music ones. She's okay with that: Lost Weekend doesn't necessarily need to thrive — it just needs to exist. "It's important to us to keep a presence on Valencia Street," Colcord said, "both as a representative of a certain era of San Francisco and because we believe in our collection."